Pumpkins have officially taken over our house. Baby pumpkins on the coffee table. Pumpkin pie (which Steve made from scratch, by the way) in the fridge. Roasted pumpkin seeds in a bowl on the kitchen counter. Big fatty pumpkins in the dining room waiting to be carved. 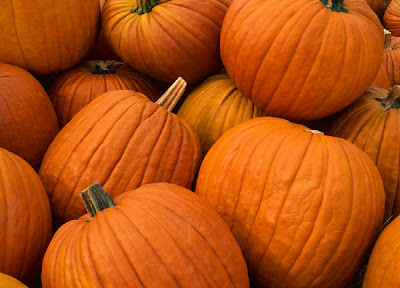 We’re going to adorn our porch with some lovely jack-o’-lanterns. I don’t care if the only trick-or-treater we’ll probably have is this guy. We’re going to celebrate the wondrous holiday that is Halloween in style. I’m going to Chicago for the weekend for a Women’s Conference. I’m excited to travel on my own, to get some rest, and for all the cool woman-y self discoveries I’m sure to bring back with me. I am not, however, excited to leave my loved ones. Yes, I am talking about my plants. Will they survive a weekend without their nurturing and attentive gardener? Will I survive a weekend without my beloved basil?! I don’t know if I can take this kind of separation. Okay, I will also miss my husband. Steve and I have spent weekends apart before, but it’s usually me at home while he’s away. The first time he was gone for a few days, I was surprised to find that I missed him most just as I was falling asleep at night. You just get used to that other person lying next to you, making soothing breathing noises for you to fall asleep to, you know? Anyway, I’m sure my husband will do just fine while I’m in Chicago. I just hope he doesn’t get too used to having the whole bed to himself. I hope you’ll post a pic of the carved jacks when you’re done. I still gotta find one for our table.Regarding your offer for a kalua pork recipe, I’ll need to purchase a slowcooker. And to find liquid smoke. Those two things aren’t very common here, although I may just need to look a little harder for the liquid smoke. Send me the recipe anyway ’cause I just might be able to make use of it one day.Have fun in Chicago! Try making some Pumpkin Mochi. I’d post a recipe on my blog, but I don’t know how to create a blog. Hey Rowena…get a slow cooker for that Kalua Pork recipe. So worth it! Try LNT, BBB, even Costco. Find liquid smoke with BBQ sauce stuff.